Can you believe this?? 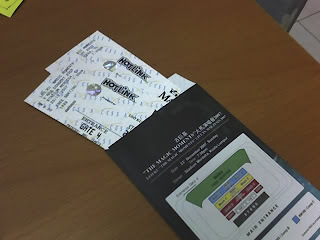 I got myself 2 tickets to watch Leo Ku's concert. The cheapest ones, of course. But who cares? It's still free. And it'll be held at Stadium Merdeka this Sunday. 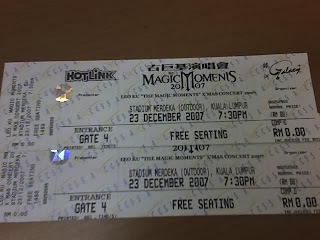 Omg, I was there for Dong Bang's concert. I'm starting to tear up cuz I miss them so much T.T Okay, that was random. You see, me & Mum was sorta debating on who should go. I intended to bring my sis while Mum wants one ticket for herself. Or it could go like this - Mum & sis go instead. But...but...*starts tearing again* I love concerts!! 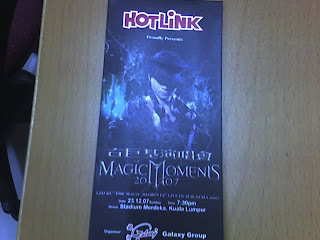 This is my first time watching Leo Ku in action~ (though I'm not a fan of his XD). I want to see the guest artiste with my own eyes. Tsk, tsk. Justin will be there. He's my fav, how can I miss him singing a song or two?! We'll see. If I update my blog with a concert report, you'll know who went. Stay tune! Check out my I.PLE blog at istyle.iple.com/waimei86. You need at least IE7 to view the blog. Pls disable all popup blockers before accessing the blog.